PHOTO PROVIDED - University of Iowa center Megan Gustafson, right, poses with WNBA chief operating officer Christy Hedgpeth and her new Dallas Wings jersey after being selected with the second pick of the second round of the WNBA Draft on Wednesday night in New York. NEW YORK — For the last four years, University of Iowa senior Megan Gustafson and Iowa State University senior Bridget Carleton have excelled for their programs. Now both women will continue representing their schools in the professional realm, as both were selected in the WNBA Draft on Wednesday night. Gustafson was taken by the Dallas Wings in the second round with the 17th overall pick, then four picks later Carleton came off the board with the Connecticut Sun selecting her 21st overall. Gustafson, the consensus NCAA women’s basketball Player of the Year, was in attendance at the draft on Wednesday and said it was an incredible experience. 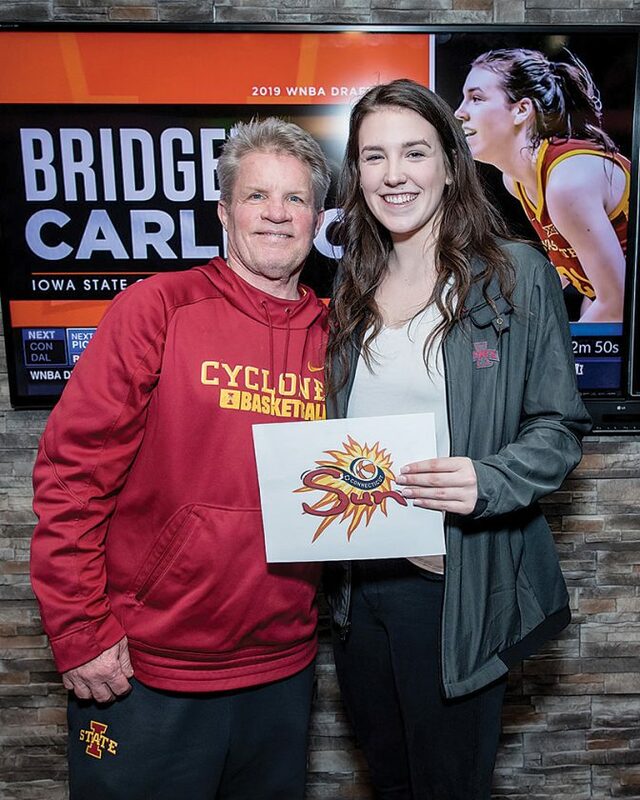 PHOTO PROVIDED - Iowa State small forward Bridget Carleton, right, and Cyclones head coach Bill Fennelly pose after Carleton was drafted four picks later by the Connecticut Sun. Carleton chose to watch the draft from a watch party in Ames, and because of that she said she almost missed the life-changing moment. Gustafson finished her Iowa career as the most decorated Hawkeye woman in program history. She owns 16 Iowa records, including career marks for points (2,804) and rebounds (1,460). She is the first consensus national player of the year in Big Ten Conference history, and she registered 33 double-doubles during her senior campaign to tie an NCAA record. She is the 13th Iowa woman to be drafted into the WNBA. Bluder said it will be a long time before someone can accomplish the heights the Port Wing, Wis., native has in her Hawkeye career. Last season the Dallas Wings were 15-19 and finished fifth in the Western Conference. They were eliminated from the postseason by the Phoenix Mercury. 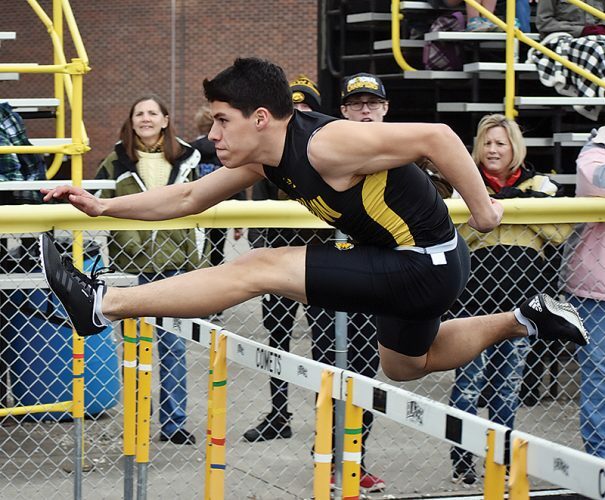 Gustafson joins a team led by women like Skylar Diggins-Smith, and she said that she will bring the same approach she had with the Hawkeyes to the next level. “Dallas is getting a player who is going to work hard for them every single day, someone who loves the game of basketball, and someone who never gives up,” Gustafson said. Carleton has had just as much of an impact during her time with the Cyclones. She ended her career just eight points shy of breaking the Iowa State all-time career scoring mark with 2,142 points. She is also third in the Cyclone record book in career field goals (713), steals (211) and blocked shots (124) and she finished fifth in career 3-pointers with 255. Carleton also recently had the best single-season in Iowa State history, setting records in single-season points (760), scoring average (21.7 points per game), field goals made (254) and field goals attempted (543). The Chatham, Ontario, Canada, native is the 14th Cyclone to be selected in the WNBA Draft, and Iowa State head coach Bill Fennelly couldn’t be happier for her. Last year the Sun went 21-13 and finished third in the Eastern Conference before being eliminated by Phoenix in the second round of the playoffs. Carleton said even from the beginning of this process she had her heart set on being drafted by Connecticut. Iowa’s Megan Gustafson and Iowa State’s Bridget Carleton were both the first players from their respective schools to be drafted into the WNBA since 2015. The Hawkeyes’ Samantha Logic was taken in the first round with the 10th overall selection of the 2015 WNBA Draft, while the Cyclones’ Nikki Moody went to San Antonio in the third round as the 33rd overall pick that same year. PHOTO PROVIDED – Iowa State small forward Bridget Carleton, right, and Cyclones head coach Bill Fennelly pose after Carleton was drafted four picks later by the Connecticut Sun. 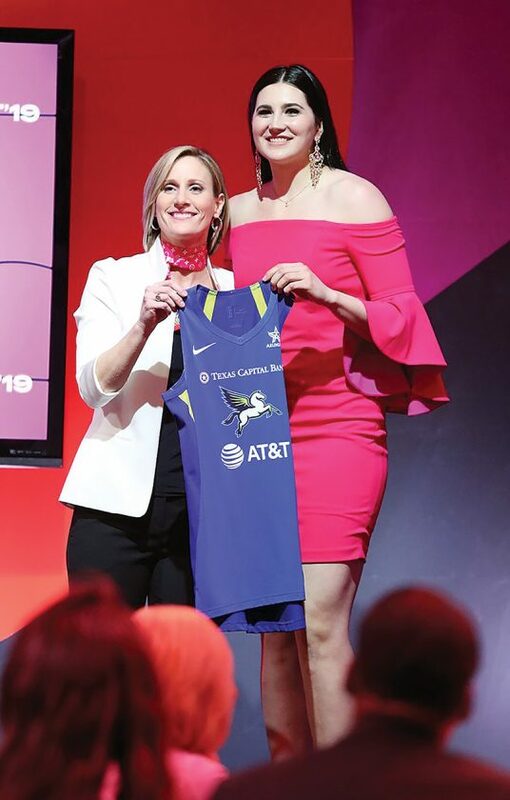 PHOTO PROVIDED – University of Iowa center Megan Gustafson, right, poses with WNBA chief operating officer Christy Hedgpeth and her new Dallas Wings jersey after being selected with the second pick of the second round of the WNBA Draft on Wednesday night in New York.